The Little Giant 10126LG is a safe, versatile, and sturdy piece of ladder, to which many owners can attest. You can guarantee safety in using this ladder on even and uneven surfaces including on the stairs, docks, ramps, and curbs since you can adjust the ladder based on the necessities of the job. As you adjust the configuration of the ladder, you do not have to worry about injuring yourself with the Little Giant 10126LG’s patented Triple-Locking Hinge that secures the adjustments in place for a sturdy position upon extension. Another advantage of the Little Giant 10126LG is its sturdiness, which is attributed to its aerospace-grade 6005-T5 aluminum build. It has a weight rating of 300 pounds but as a result of testing, it was able to withstand up to 1200 without structural collapse. Surviving this high level of stress just proves that this ladder is made of high quality materials that will last long and will not easily break or be damaged. Lastly, the versatility of the Little Giant 10126LG is one aspect to look out for. It has the capability replace 60 to 70% of manufactured portable ladders as you have 24 different configurations to which you can set it. Its 5-way design enables you to adjust it depending on the surface you will be putting the ladder on and the height that you need to reach with it. The ladder is a combination of 24 different ladders in just one package. This ensures sturdiness and stability as you work on the ladder while using heavy tools. The ladder is easy to transport from one location to another just by wheeling it around. This feature is for making secure adjustments on the ladder as you extend it. The manufacturer offers a lifetime full warranty for their line of ladder. This displays their confidence in the quality of their ladders. Who Needs the Little Giant 10126LG 300-Pound Duty Rating Ladder System? Investing in the Little Giant 10126LG is a must for anyone. At home, you will need ladders for a variety of reasons: simple or complex repairs, paint jobs, reach high places, changing light bulbs, installing storage units, and several others. So no matter what your line of work is, if you are a homeowner, you will definitely need a ladder and one of the best options you have is the Little Giant 10126LG since you have all the ladder types you need in this single package. If you are a home improvement enthusiast, painting expert, repairperson, and any other similar job, you will benefit from the Little Giant 10126LG. Customer Reviews: What Do People Reveal About the Little Giant 10126LG? 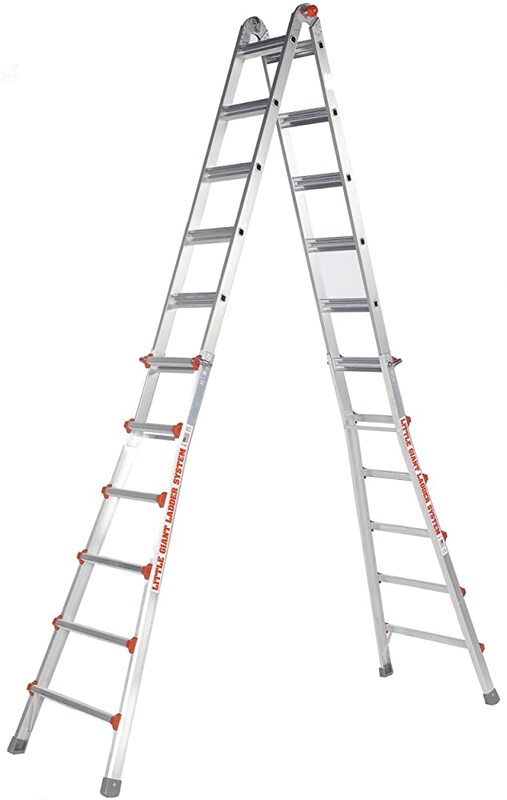 On the internet, you can access great amounts of reviews on ladders such as the Little Giant 10126LG. Amazon, in particular, is one of the websites where you can find actual buyers and owners of this ladder and read on what they have to say about the product. As of this writing, Amazon has 107 published reviews for the Little Giant 10126LG. A huge percentage of the customers awarded the ladder with 4 to 5 stars, while some strayed from the trend, giving the Little Giant 10126LG 1 to 3 stars. The satisfied customers exclaimed on the versatility and user-friendliness of this ladder. While some customers expressed disappointment about the sturdiness and the weight of the products. Nevertheless, many customers perceive the Little Giant 10126LG as a worthy piece of ladder commendable for its features and overall quality. The abundance of positive reviews about the Little Giant 10126LG can only help so much in making a purchasing decision. The evaluation of the overall quality of the ladder is still up to you. The features of the Little Giant 10126LG must be compared with your necessities, preferences, and budget. But amidst all of these, this ladder is one to consider for its usefulness and convenience. Even though it has some shortcomings such as its weight, which is addressed by the presence of wheels in the ladder, it is still one good ladder that you can use for different purposes.